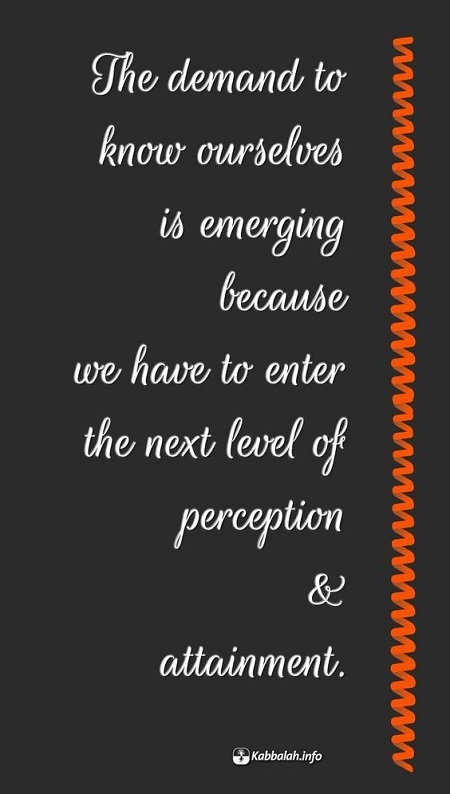 The demand to know ourselves is emerging because we have to enter the next level of perception & attainment. Kabbalah advises us to fantasize in abstract form about the future, but then work on ourselves in order to “pull up” our desires and matter to the level of that fantasy. Then the abstract form will clothe into matter; we will change instead of simply mistaking our fantasies for actuality. Our greatest problems in life come from the fact that we attribute what we desire to actuality and build plans based on fantasies, thereby separating from matter.